I’ve been talking about citizen science a lot recently, but I’m going to do it again today. I think citizen science is a great thing! Some of the projects are incredibly simple and require very little effort on the participant’s part, but produce massive results for the scientists. I especially love those projects and I try to participate in as many as I can. One of these super easy projects that I recently participated in was School of Ants. Other entomo-bloggers have gotten involved in this project, so you may have already heard about it from other insect blogs (such as Myrmecos or Wild About Ants), but I’m going to share my experience anyway. I think the project is fantastic and I want to get the word out to as many people as possible. The sheet of paper had the instructions on one side and space to record data on the back. It explained the three different types of vials. 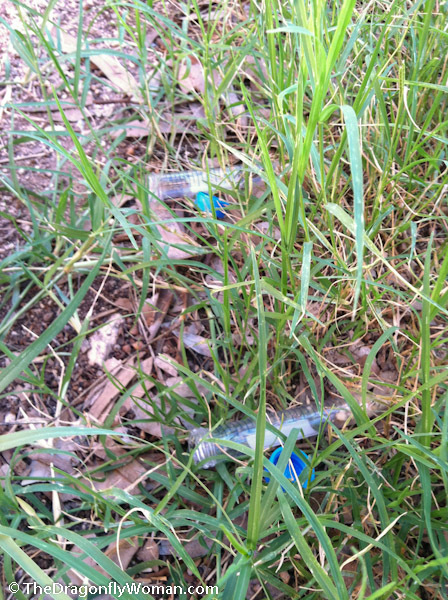 The blue capped vials are for green areas. 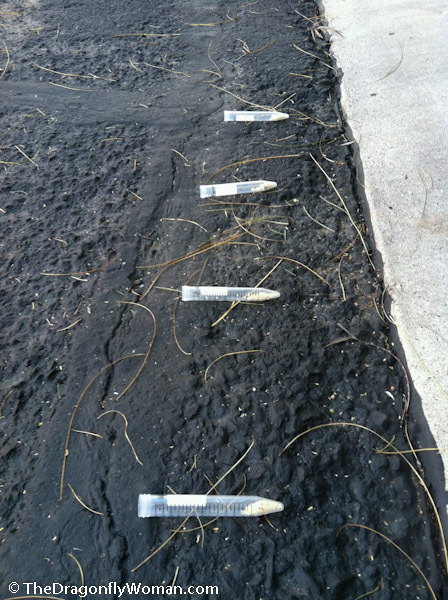 The red capped vials are for paved areas. The orange capped vial gives people who aren’t entomologists an incentive to participate. I’ll get to that vial in a moment. Ah, bermuda grass and eucalyptus leaves. It’s pretty much my worst nightmare: a yard full of little allergen factories that make me want to die come July when I can no longer breathe. But there were lots of little ants in there! And they were really excited about the bait. Now you may be wondering what bait the School of Ants team puts in their vials. According to my ant researching friends/colleagues, there is one ant bait that is the ultra mega granddaddy of all ant baits: Pecan Sandies! All those little crumbs in the pictures above are delicious cookie crumbs! Ants apparently find them irresistible. 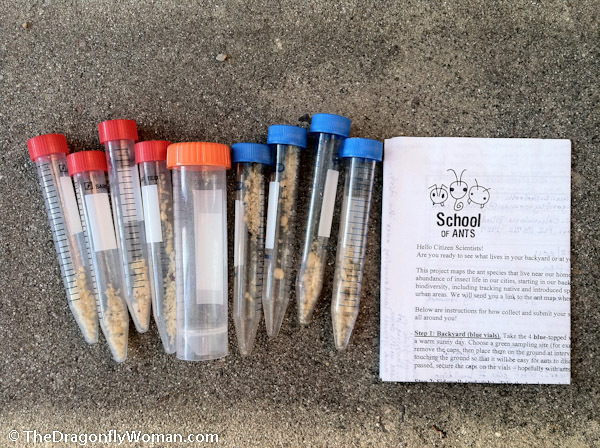 The instructions for School of Ants say to leave the vials for an hour so the ants have enough time to discover the cookies inside, so I left them to feast and headed to my paved area. Easy! I left those for an hour too, wondering what sort of exciting ants I was going to get. I’d driven the fire ants out of my yard about 3 weeks before I got my kit, so I was super excited to see what ants had moved back into my yard. When my hour was up, I rushed out back to see what I caught in my green area and saw… fire ants! More $&$*#$@ fire ants and absolutely nothing else! Same thing for the vials in the front. After I capped my vials and put them in the freezer to kill the ants (the preferred method according to the instructions), I spent the next hour baby powdering my fire ants and setting up lines of diatomaceous earth along the fences to keep them from coming back in. In spite of the fact that I didn’t find any exciting new ants in my vials, I was happy to catch the fire ants moving back in before they became a huge problem again. And they haven’t been back since! Woohoo! So back to that orange capped vial. As a thank you for participating (at least as far as I could tell), the School of Ants team included a vial in which I could put any insects I wanted to have identified. Want to know what that fly in your house is? Catch it, freeze it, and put it in the Everything Else vial when you send the kit back! I briefly flirted with the idea of putting something really hard in my vials, like a blepharacerid pupa, but that would have been mean. I am capable of identifying my own insects after all, but how great is it that they’re willing to trade some insect identification time for your ants? Give a little, get a little – win-win for everyone! 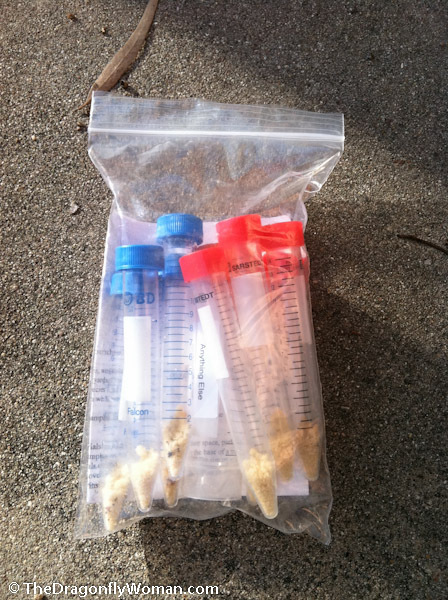 I filled out the data sheet, froze my ants, and mailed my kit back. The ants will be counted and identified at some point. My location will be placed on the map on the School of Ants homepage, and – and this is really awesome – I’ll be able to look up a list of the ants that the researchers identified from my yard! I’ll finally know for certain whether my fire ant is the native fire ant or the invasive red imported fire ant. I think it’s the native ant, but I really want that confirmation. School of Ants has been incredibly successful! They quickly mailed all their kits and are mostly only supplying them to school groups now, but they’re still letting people participate. Now they’re asking people to provide their own Pecan Sandies and place the crumbs on index cards in green and paved areas. You then dump the card, the cookie crumbs, and any ants into plastic bags before you freeze them and mail them off. There’s also now an online form for the datasheet. I imagine the researchers learned what I did with my citizen science project last year – automation is good! It can save untold hours later. So. School of Ants. Do it! A few minutes of your time, a few supplies, and a little postage can really make a difference. And, you’ll walk away knowing what ants live in your yard. Everybody wins!